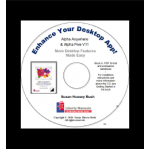 Inside Enhance Your Desktop App! Don't worry about losing your computer files! A free Electronic Download Edition will also be automatically added to your order. This is part two of a three volume set. Click the Buy Together tab above to get all and save. Better yet, combine with the Functions Handbook to take full advantage of the software and save even more! This is part two of a two volume set.Click the Buy Together tab above to get both and save. Better yet, combine with the Functions Handbook to take full advantage of the software and save even more. Files may be combined on one or more CDs. Files may be combined on one or more CD's. 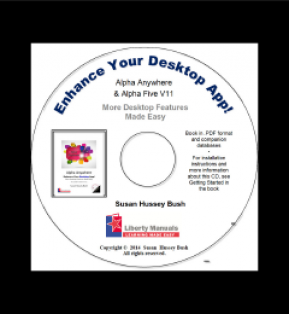 Alpha Anywhere Enhance Your Desktop App! Glue this book to your side while you are developing your application. For users familiar with database design. Learn how web forms fit into your desktop application. Create your first grid component. Learn the best ways to use images in your database. Find your customers with a Google Map, learn all about their hobbies with Google Image Search..
Jump from an embedded browse to a form for further editing. Add charts to forms and reports. Add Bookmarks, a Table of Contents and an Index to your report. 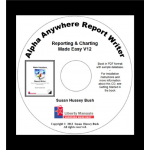 Learn to put the right headers and footers into your reports. Learn the best ways to Find, Sort and Filter your data. Enhance your application with Checkboxes, Radio Buttons, Listboxes and Tree Controls. Add outstanding Graphics to your database. Use Action Scripting to point and click your way to Xbasic. Get user input with Xdialog and create Custom Menus. Get just the right Color and maintain a consistant look with Stylesheets. Use Alpha Five to E-Mail and Fax and send a mass email to your contact list with AlphaMailer. Chapter 6: Find It! Sort It! Filter It! Chapter 8: Customize Your App! What file type is best for you? DBF or SQL. It's all explained here. 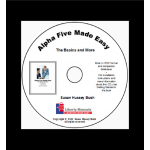 All about the Alpha Help system. How to set up Field Rules and Data Entry. The principles of Sets and Mapped Tables. How to create outstanding Forms and Browses. Introduction to the Web. Get your feet wet! Introduction to Mobile. Learn what all the fuss is about. What you need to know about Operations. Creating fancy and simple Buttons, Hyperlinks and Bubble Help.